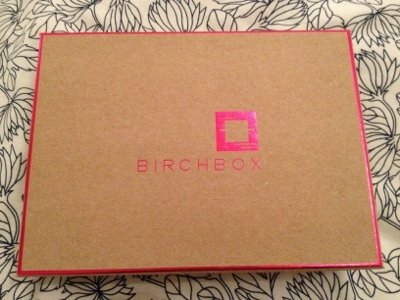 This month, I was lucky enough to receive a preview box of the upcoming March Birchbox*. Birchbox are an American company that have recently launched in the UK. Each month you receive 4-5 beauty samples, plus a little magazine featuring the products in the box. The boxes cost £10 per month plus p+p. I've seen reviews of their first two boxes and was quite impressed - they had a good variety of products, along with some US brands that are hard to find in the UK. Beauty Blender (full size RRP £16) - can't wait to try this out! I'm not sure if this is a travel sized version of the beauty blender, I will try to find out. Blender cleanser sample - a handy bottle of cleaning fluid for the Beauty Blender sponge. Laura Geller waterproof gel liner in purple (full-size RRP $16.50) - a US brand, this is marketed as one of the 'most long-wearing gel-based liner you’ll ever get your hands on'. This is a soft aubergine colour which will make a nice change from my usual black. Yu-Be moisturising skin cream sample - (RRP £13.50 for 33ml) - Japan's most popular vitamin-enriched skincare cream, this is a multi-use product for dry skin. Molton Brown Valbonne perfume sample (RRP £65 50ml) - a new, unisex fragrance from Molton Brown. I really like that there's a variety of makeup and skincare. A lot of boxes seem to send lots of skincare which can be a bit tiresome if it doesn't match your skin type. The mini beauty blender is a fantastic addition as far as I'm concerned as I always wanted to try one of these! I'm not that keen on the body lotion purely as the second ingredient is mineral oil so I'm unlikely to ever use that. Yu-Be is a Japanese brand stocked in Space NK which I've eyed up before, so despite it only being a tiny sample, it's nice to get to try it without paying out full price. Overall, I'm pretty pleased with this box. What are your thoughts on Birchbox? Wow these look great! And £10 for all those goodies doesn't seem too steep either! Ooooh I love the look of the beauty blender! they look great :) Can't wait to see how you get on with it. Looks like you got some lovely products! Excited that you got a beauty blender!!!! So jealous! I've wanted a Beauty Blender forever! I really want to try the Beauty Blender, everyone seems to love it. 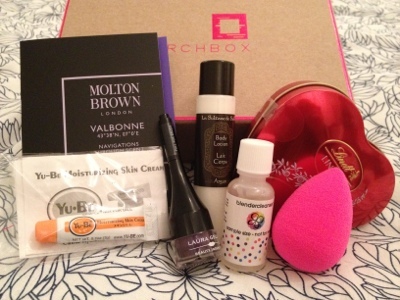 Wow, it looks like this month's Birchbox is a good one. I've heard a few people saying they were thinking of ending their beauty box subscriptions so it looks like maybe they have listened and tried to step up their game. I think the beauty blender is a great item to be included and it's nice that you even get the special cleansing fluid with it too.